I am very excited to introduce the newest series within our Member Interviews: the Volunteer Chronicles! We’ll be adding interviews with our long-term volunteers to the monthly Member Interview posts from time to time, to gain a fresh perspective into the organization we all know and love! And we have a wonderful volunteer to get us started – our new Assistant Regional Advisor, Gayleen Rabakukk! Before becoming an ARA for our chapter, Gayleen served as a moderator for the Middle Grade Online Book Club. 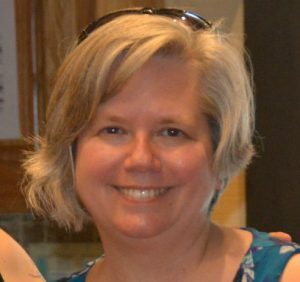 She is a beloved member of not one, but two SCBWI critique groups, a published author of nonfiction books for adults, a Cyntern and a regular teaching assistant at the Writing Barn. I’m not sure where she finds time to work on her writing, but thankfully, she carved out a little time in her very busy schedule to answer some questions for us. Can you tell us a little bit about your volunteer role(s)? For the past two plus years, I’ve been one of the moderators of the MG online book club. That reminds me, time to post another discussion question! This group has really increased my reading – we cover one book each month, but I’m also reading other MG books to see if they’d be a good fit for future discussions. In July, I transitioned into a new role as the chapter’s Assistant Regional Advisor. I’m still figuring out exactly what that entails, but basically, I’d sum it up as “helping.” I help plan our monthly meetings, our annual conference, special projects and events. Then helping spread the word about all those things once they are planned, as well as supporting our members and answering questions whenever I can. What interested you about volunteering for SCBWI initially, and what have you gotten out of the experience? I started volunteering for SCBWI several years ago, back when I lived in Oklahoma. That was a much smaller chapter, so there weren’t as many events or volunteer opportunities. Still, I learned early on that working registration at a conference was an awesome way to meet people. When I moved to Austin, I got involved with volunteering right away, helping at the conference and set-up for the holiday party. I’m introverted and having a job to do always makes me feel more comfortable. Over the years I’ve made so many more friends because volunteering got me off the sidelines and into the mix of things. I highly recommend it! We have a wide range of volunteers, from those just starting out in writing to published authors and everything in between. 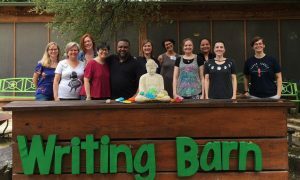 Where in the writing journey are you? My answer is likely to vary widely depending on how my writing day has gone. Some times it feels like I’m just starting out… Actually, I’m somewhere in between. I’ve been writing professionally since earning my journalism degree 20 years ago. I’ve published magazine articles and even two nonfiction books for adults. Ten years ago, I decided what I really wanted to do was write for kids. I went back to school and earned an MFA in writing for children and young adults. After collecting a large stack of rejection letters, I finally signed with an agent and have been revising an MG novel with her guidance. What surprises you most about this writing life? How thrilling and mysterious words on the page can be! Few things more exciting than being completely swept away by a story I’ve created. I get blown away by these characters that seem so fresh, doing awesome things and I pump out an astronomical amount of words in a single sitting. But then when I go back and look at it the next day or the next week, I see that the character I thought was the protagonist is actually the secondary character and maybe the story would work better in third person. With a little bit of distance, it’s completely different and I wonder why didn’t I see it before? Story and language can be slippery. Do you have any favorite craft books, courses or resources? My number one resource is reading in the genre I’m trying to write. When I read a section I love, I analyze it closely with the aim of figuring out exactly what the author did to make me love it. At any given time, I usually have a print book I’m reading on my nightstand (almost always MG) and an audio book on my phone for driving time and while I’m doing housework. The audiobooks run the gamut, they could be MG, but are just as likely to be adult nonfiction on a subject related to my WIP. Recent titles have included The National Parks by Dayton Duncan and Uranium by Tom Zoellner. 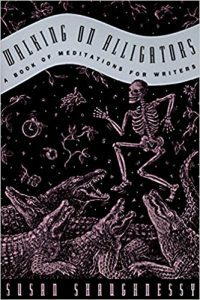 I’m not good at finishing craft books, but I do have one that’s become a mainstay of my daily writing practice: Walking on Alligators: A Book of Meditations for Writers by Susan Shaughnessy. Each page of the book starts off with a quote related to the writing life from an author or playwright or song writer. Then Shaughnessy has an essay that expands on the quote, no longer than one page. When I sit down to write, I read a page and take a few minutes to focus my mind and commit myself to writing. Then I set my timer and don’t move until the buzzer sounds. Following those steps daily has significantly increased my productivity this year. Another fantastic resource I’ve found are the SCBWI critique groups. I’m actively involved in two groups, in addition to having a regular critique partner. The open groups are a good way to find out if what’s on the page is working as intended, which is really invaluable. I also have to give a shout-out to The Writing Barn. I’ve served as a teaching assistant for several classes there and they’ve all been top notch. If you’re looking to take your craft to the next level, the Barn is a fantastic option. Being part of the team may make me biased, but Cynthia Leitich Smith’s Cynsations blog is also a good resource (I read it faithfully, long before I became a Cyntern). We try really hard to make sure each post has valuable reader takeaway to help navigate the publishing world, for both beginners and those who are well published. What was your favorite childhood book? Have you read it again as an adult? 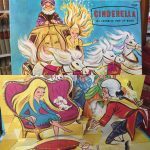 I had a pop-up version of Cinderella that I absolutely loved. My mom found it in a storage closet last year and sent it home with me. I was surprised to see that the book actually only had four spreads. Many of the details I remembered didn’t appear in the text, but were stories I had invented – probably so I could spend more time looking at the pop-up illustrations. The last picture on your phone is of what? 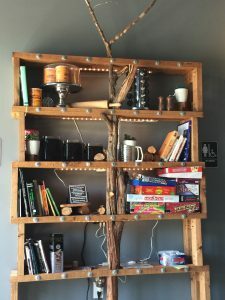 A funky bookshelf (with a tree branch going up the middle and sticking out the top) spotted at a doughnut shop. Would you rather eat breakfast for dinner every day, or dinner for breakfast? Breakfast tacos are good any time of day! Pegasus – I long to soar! It’s Karaoke night and you must sing. What song do you choose?